Our Arts & Crafts Trestle Table is a top seller, providing ample room for your closest friends, neighbors, and family. Break bread at a table whose construction alone makes dining special! Arts & Crafts style derives much of its inspiration from the natural world, which means tables feature craftsmanship over ornamentation, and wood's beauty is further enhanced by rich finishing. 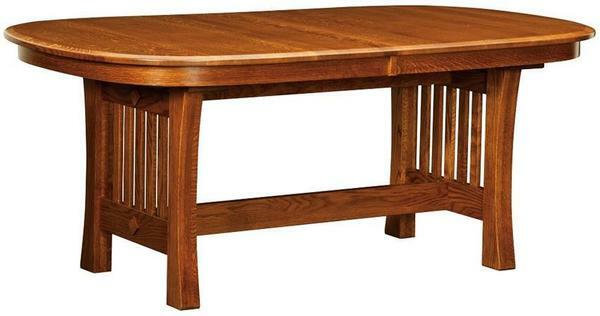 Enjoy the best of Craftsman style with this trestle table, customized to your specifications. Order with a banquet or rectangle tabletop in your choice of thickness, in the precise wood and stain that will suit your home. Also available with extensions. Call us with any questions, and see many of our other Arts & Crafts pieces. This table is American-made in an Amish woodshop.